The Times (Obituaries, 4 August 2008) reported that “John Thornes was one of the most eminent and influential physical geographers of his generation.” John’s keen interest in understanding landform processes and evolution was furthered through a variety of methods and informed across a range of disciplinary boundaries. In particular he pushed for better integration of monitoring, theoretical and simulation modelling, field and laboratory experimentation and remote sensing techniques. Although dominated by an interest in the Mediterranean region and problems of land degradation, his research activities ranged across a number of time scales and with other environmental perspectives. This collection of papers reflects this wide range of John’s interests through the recent work of scientists and professionals most strongly influenced by his rigorous training or leadership. 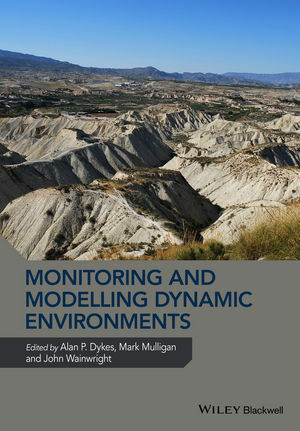 The thematic focus of the book, which runs through all of the main contributions, is the integration of different methodologies and the application of this approach to improved understanding of natural systems and the development of appropriate strategies for environmental and resource management. Short overviews of John’s contributions to geomorphological research are also presented to provide context for the origins of this book. Alan Dykes undertook a PhD on tropical rainforest landforms in Brunei, supervised by Professor John Thornes, then took up his first academic post lecturing in geomorphology at Huddersfield University. Now a Senior Lecturer in Civil Engineering at Kingston University, he continues his research into all aspects of landslide science from geotechnical controls to landform evolution and specialising in peatland instability. John Wainwright has researched questions of soil erosion, ecogeomorphology, land degradation and landform evolution across a range of space and time scales, originally inspired by the supervision of Professor John Thornes in his PhD on the erosion of prehistoric archaeological sites. He has subsequently lectured at the universities of Southampton, King’s College London, Sheffield and Strasbourg, and is now at Durham University, where he is Professor of Physical Geography. Mark Mulligan is currently a Reader in Geography at King’s College London. Professor John Thornes supervised Mark's PhD at King's College London from 1991. Mark has remained there as a member of the academic staff since 1994 and in 2004 was awarded the Gill Memorial Award of the Royal Geographical Society–Institute of British Geographers for ‘innovative monitoring and modelling’ of environmental systems. Mark works on a variety of topics in the areas of environmental spatial policy support, ecosystem service modelling and understanding environmental change, at scales from local to global and with a particular emphasis on tropical forests in Latin America and semi-arid drylands in the Mediterranean.